If you want to run a successful ag operation, it just comes with the territory to stress about your P&L impact. You think all the time about how to reduce overhead and increase revenue. Not to mention balancing customer and employee happiness, and staying on top of innovation and technology to get ahead of the competition. It can be stressful to get everything done on time and on budget. So, if you want to affect your bottom line right now for the biggest P&L impact, what can you implement in your operations to get the biggest ROI that actually works? According to Forbes, "it can pay more to cut overhead than to boost sales, because typically, more of the cut to overhead will fall directly through to profits than will a similar boost in sales." The Gartner Group estimates that a 5% reduction in operating costs has the same P&L impact as a 30% increase in sales. And for most ag retailers, reducing 5% of operating costs is as simple as cutting just minutes off your routes. If you want to improve your bottom line, then start by lowering your operating costs through better time management, streamlined efficiency, and increased productivity. What if you did a little experiment for a day and gave every person who talks to drivers or employees a stopwatch? Then had them start the timer every time they picked up the phone to see where a driver is and stopped the timer when they hang up. How much time do you think they would spend coordinating routes on their phone? Let's say, for example, one phone call on average takes three minutes, and you have ten drivers. Now multiply that by ten times a day. That is an estimated five hours wasted on the phone trying to figure out where everyone is and where they should go. That is five hours of lost productivity that can be used better. Now, I'm sure you aren't going to give your employees stopwatches for a day, but hopefully, the exercise makes you think about how you are spending your time in your operations. So, are you running them as efficiently as possible? It will estimate wasted idling, non-productive miles driven, non-productive time of employees as well as the benefits and costs of implementing Razor Tracking. Experts at Gartner estimate that "70% of the most profitable companies will manage their business processes using real-time predictive analytics or extreme collaboration." So, investing in new technologies such as Fleet Tracking Systems that use real-time data and analytics to pinpoint the whereabouts of your vehicles and manage your field service process is crucial to staying ahead of the competition. Wouldn't it be great to be able to type in an address and see which vehicle is closet to a service call? Of course, it would. Fleet Tracking makes it easy to search for a driver and find their location in seconds. Before tracking, you would have to call all your employees you think are closest and hope they can answer. Because sometimes your employees aren't going to be able to respond, which in turn means you have to make another call until you can reach the closest person. The less time you spend on the phone, the better; it will free up everyone's ability to complete other tasks at hand. Instead of having to make ten calls, you might only have to make one. That one call will at least be to the correct employee. What if you could improve customer service by letting your customers know their service time frame within seconds? A Fleet Tracking System will give you the ability to communicate better on expected arrival times and ensure driver location accuracy. You will have multiple views of all your vehicles, including setting up geofencing and points of interest, which means you will always know who is closest to a service call. Therefore, improving response time and ensuring happy customers. The quicker you respond to your customers the happier they will be, and the more likely to keep using your services. Because repeat customers are the best customers. Think about how much easier dispatching would be if you could view all your vehicles on one screen — allowing you to know exactly where they are the moment you have to get them somewhere. A Fleet Tracking System will enable you to keep all your vehicles and equipment in check and give you a total view of your employees and their location. Therefore giving you the control and transparency in your operations to make better decisions on timing, efficiency, and productivity; the three main areas that will reduce your overhead and increase revenue. Having the ability to see how your company is moving throughout the day will make it easier to manage on the fly. Because managing your entire operations on one screen empowers you to make quicker, smarter decisions. Not to mention making the correct decision every time. A Fleet Tracking System is becoming a critical component of all successfully run ag retailer operations. Most are using it as a way to prove to customers of service satisfaction and gain a competitive edge. Mike Wolf with CHS Sunprairie says, "It is a convenience for communicating with our customers on what time they can expect us at their farm and making sure drivers are going to the right location." Many ag retailers have saved between $300,000 - $600,000 in equipment costs per business unit with a Fleet Tracking System. And most see a 30% increase in operational performance in a single season. "Some of our business units have been able to reduce their fleet by one machine and in some cases as many as two. With each machine costing in excess of $300,000", says Tom Lehar VP, CHS Northland Region. 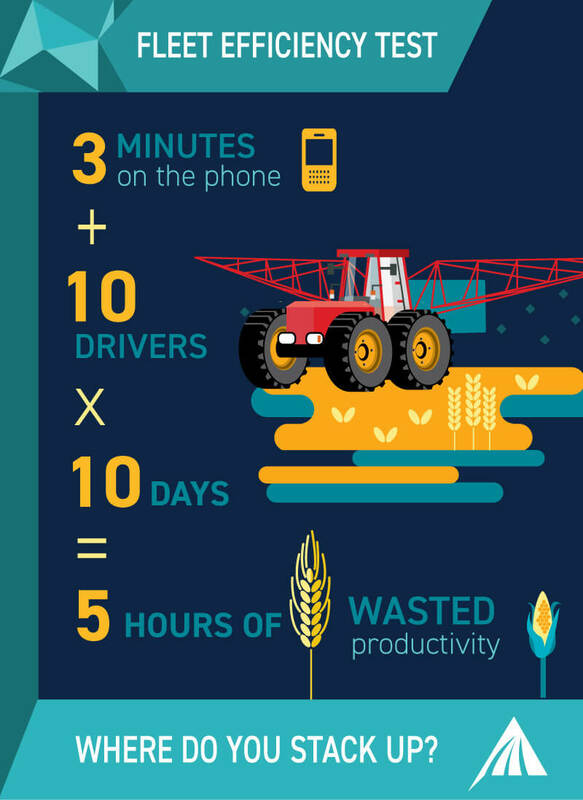 Razor Tracking is The #1 Ag Operations Tool designed to manage and coordinate agronomy operations in the most efficient way possible. The platform is created entirely for Ag Retailers to help maximize efficiency, lower stress, and enhance their bottom line. The Razor Team is so confident that Razor Tracking will improve your bottom line that we do not require contracts, and offer a 60-day money back guarantee. We also have a 6 months seasonal suspension, because when you are off, the platform can be too. Schedule your Demo Today with one of our Razor Tracking experts and find out how you can reduce overhead and increase revenue. Yes, You Should Trust Your Employees, but is the Feeling Mutual? Should You Invest in a Fleet Management System? Find out how you can improve your operations today. © Copyright 2019. Razor Tracking All Rights Reserved.